History: (What If? Special#1 (fb)) - When Tony Stark was in Asia observing field tests for his munitions company, he tripped an anti-personnel mine that caused a piece of shrapnel to become embedded in his heart. He was found by the warlord Wong Chu and ordered to build him a weapon in exchange for his own life. Chu also gave Stark the captured Professor Yinsen to use as an assistant. As time passed, Tony and Professor Yinsen constructed a suit of armor that would both keep Tony's heart pumping and allow them to escape Chu's tyranny. Just as the armor was completed, Tony collapsed due to his heart and was immediately put inside the armor. (What If? Special#1) - In order to buy Tony some time to get the armor up and running, Professor Yinsen sacrificed himself to distract Wong Chu. Unfortunately, he did not buy Tony enough time and Wong Chu arrived to find Tony lying motionless inside the armor. Just as Chu gloated over his victory, he received a telegram demanding that Stark be transported north, signed by Chen Lu. Once Tony had been sent to Chen Lu, Lu announced that he had added a device inside the armor that would allow Lu to shut it off by remote control. He then announced that if Tony did not do as Lu asked, he would shut off the armor, causing Tony to die. While Tony exclaimed that he would never betray America, Chen Lu left Tony to his torturers. Not long after, American soldiers discovered Tony's location and arrived to rescue him from Lu. Tony soon returned to his life as an industrialist and was almost immediately confronted by the C.I.A. 's Nick Fury, who believed that Chen Lu had gotten to Tony. Tony dismissed Fury's claims and afterwards, sat down at his desk, only to mentally contacted by Chen Lu via a small vibratory transducer implanted in his skull during the torture. Lu reminded Tony of who he served and despite his hatred of Lu, Tony then contacted the head of the Senate Armed Services to announce the newest addition to the American arsenal: the invincible Iron Man. The Iron Man armor was introduced at a military get-together attended by the Fantastic Four as well as other heroes Thor, Ant-Man, and the Wasp. Impressed at Iron Man's arsenal, Iron Man was welcomed into the superhero community and soon after, as Tony was updating the armor, he was contacted once again by Chen Lu. Tony/Iron Man announced that he couldn't live like he was but Chen cut off the armor, reminding Stark of his loyalties. In the days that followed, Iron Man proved his battle prowess against threats such as the Melter and the Crimson Dynamo while the Fantastic Four first battled Doctor Doom and Thor battled the menaces of the Cobra and Mister Hyde. After one such battle, the Fantastic Four returned to the Baxter Building to find Nick Fury waiting for them. Fury, still convinced that Stark was working for the enemy, asked Reed if it was possible for someone to control the Iron Man armor from across the world and Reed admitted that it would be possible, considering how the U. S. used satellites. Soon after, a U.S. marine lieutenant visited Stark and gave him documents concerning to formation of S.H.I.E.L.D. which Chen Lu found very interesting. As Nick Fury was having his eye checked, he was attacked by agents of Hydra and Chen Lu congratulated Stark on his role in the attack. While Fury recovered from the attack in a local hospital, the Fantastic Four visited him and Fury once again announced his suspicions that Stark was working for the enemy. Reed explained that while he didn't believe Fury's accusations, he would at least check into it. Not long after, the Invisible Girl snuck into Fury's hospital room and explained that a satellite link between Iron Man and someone else was found when the Thing and Human Torch spreaded "detector dust" that allowed Reed to trace signals within the area. Discovering Reed's handiwork, Chen Lu immediately ordered Stark to kill Reed Richards and Stark eventually agreed to save his own life. That night, as Sue, Johnny, and Ben went to a show, Reed stayed at the Baxter Building alone. 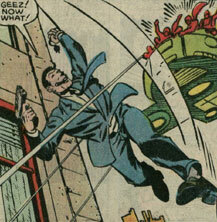 Iron Man soon broke into the Baxter Building and attacked Mister Fantastic. As Mister Fantastic sent a hologram of himself to distract Iron Man, the real Reed noticed that Iron Man dropped a cassette tape on the ground and upon playing the tape, Reed discovered that Chen Lu was blackmailing Iron Man by controlling the shut-off switch to his heart. Reed then confronted Iron Man and managed to explain that he knew the situation without Chen Lu catching on to their discussion. Iron Man pretended to attack once again and allowed himself to be defeated so that Reed could take over, remove him from the armor, and perform surgery on his heart. While Tony recovered in a hospital next to Fury, Reed explained to Fury about Stark's former predicament and while Fury asked about the Iron Man armor, the armor itself was racing toward Chen Lu's headquarters, packed with guidance systems and explosives. Just as Chen Lu was informed about the armor's arrival, the armor crashed into the headquarters and exploded. Comments: Created by Peter B. Gillis, Steve Ditko, and Pat Redding. This reality's divergent point occurred during the events seen in Tales of Suspense I#39 (March, 1963). 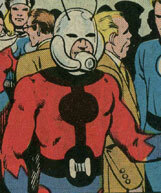 Ant-Man was the same as his Earth-616 counterpart except that, in this reality, there was no Avengers for him to help form. When Tony Stark returned from Asia, Ant-Man and other heroes visited the press conference where Stark unveiled the Iron Man armor. He presumably had the same shrinking abilities that his Earth-616 counterpart had. Wong Chu was the same as his Earth-616 counterpart up until he discovered Tony Stark powerless in his suit of Iron Man armor. Without the proper power to overthrow Chu, Tony Stark was helpless as Wong Chu gloated over his victory. One of Chu's soldiers soon reported the location of Stark and Stark was sent to Chinese scientist Chen Lu, much to Chu's annoyance. 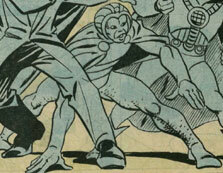 The Cobra, like his Earth-616 counterpart, was an early foe of the mighty Thor. He presumably had the same contortionist-like abilities that his 616 counterpart had. The Crimson Dynamo was exactly like his Earth-616 counterpart and was an early foe of Iron Man/Tony Stark. The Crimson Dynamo armor presumably had all of the same weapons and gadgets that the Mark I Crimson Dynamo armor of Earth-616 possessed. Doctor Doom was exactly like his Earth-616 counterpart, fighting the Fantastic Four early in their career. Doctor Doom presumably had the same minor sorcery abilities that his 616 counterpart had. The Fantastic Four were the same as their Earth-616 counterparts up until they attended the press conference announcing Tony Stark's Iron Man armor. 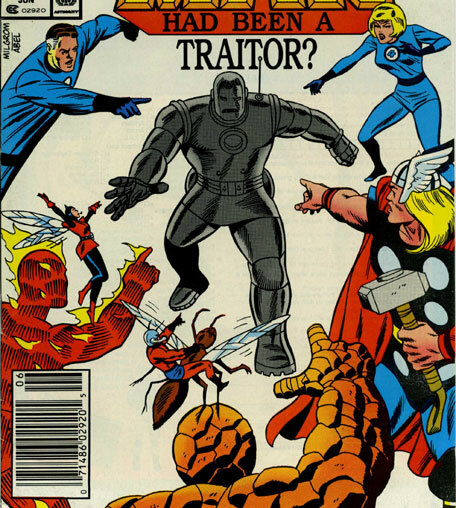 Soon after, Nick Fury visited them and tried to tell them his theories that Iron Man was working for the enemy and Reed Richards agreed to investigate, despite the entire FF's disbelief that Iron Man was a villain. Eventually discovering a satellite connection between Tony Stark and another, the Invisible Girl snuck into Fury's hospital room and explained the situation while Reed sent the Thing and Human Torch to cause a fight outside one of Stark's labs. When Iron Man came out to calm their "temper," Reed was able to trace Iron Man's satellite link due to the detector dust he had the others lay down. 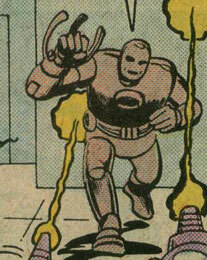 As Reed discovered more about Iron Man's true loyalties, the Chinese scientist Chen Lu ordered Iron Man to kill Reed. Iron Man soon attacked Mister Fantastic but in the course of the battle, dropped a cassette tape on the ground. Distracting Iron Man with holograms, Reed played the tape at high speed and discovered the truth about how Chen Lu was blackmailing Iron Man. He quickly let Iron Man know his plans using code words and Iron Man feigned defeat in order to allow Reed to remove the implants that Chen Lu had installed in Stark, as well as repair his heart. The entire Fantastic Four then explained to Nick Fury the truth as well. Each of the Fantastic Four had the same powers that their Earth-616 counterparts had, including stretching (Mister Fantastic), invisibility (Invisible Girl), flame control (Human Torch), and superhuman strength (the Thing). 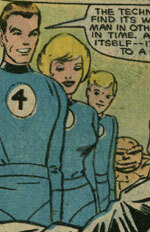 They were (from left to right): Mister Fantastic, Invisible Girl, Human Torch, and the Thing. Nick Fury was the same as his Earth-616 counterpart up until Tony Stark returned from Asia. Being a C.I.A. operative, Fury immediately suspected Stark of being brainwashed by communist enemies. He eventually confronted Stark and explained his theories but Stark threatened to go to the press if Fury continued to harass him. After helping the Fantastic Four against the Hate-Monger, Fury visited them and explained to them the same theories about Stark. While the FF did not believe Iron Man/Stark was a villain, Reed Richards agreed to investigate. Not long after he was due to be appointed the head of the up-and-coming S.H.I.E.L.D. agency, Fury was attacked by members of the terrorist Hydra group and hospitalized. While he recovered, the Invisible Girl snuck into his hospital room and told Nick that Reed had discovered a satellite link between Iron Man and an outside source. After Reed saved Stark's life during a forced attack by Iron Man, Reed and the FF visited Nick once again to explain that Stark had been blackmailed into working for the communist Chen Lu. "Happy" Hogan worked for Tony Stark and was exactly like his Earth-616 counterpart. Hydra was exactly like their Earth-616 counterpart up until they allied themselves with Chen Lu in an effort to assassinate Nick Fury before he could become the head of the up-and-coming S.H.I.E.L.D. agency. After they managed to hospitalize, the Supreme Hydra warned Chen Lu not to take them lightly. Like his Earth-616 counterpart, Tony Stark was a munitions manufacturer who, on a visit to Asia, tripped a mine that lodged shrapnel in his chest. He was soon captured by the warlord Wong Chu and forced to build a weapon for him. Instead of building a weapon, Stark and a fellow captive Professor Yinsen constructed a suit of armor that would both keep Stark's heart pumping and help them escape Chu's tyranny. Unfortunately, the armor was not fully charged before Wong Chu found Stark and Stark was sent to the communist Chen Lu, who tortured Stark and implanted devices inside his body that allow him to monitor Stark's life. Lu then arranged for Stark to return to America where he blackmailed Stark into working for him. He first had Stark set himself up as a hero under the name of Iron Man and upon discovering through Stark that Nick Fury was about to become the director of the newly-created S.H.I.E.L.D. agency, Lu arranged an assassination attempt. Fury had earlier tipped Reed Richards of the Fantastic Four off to his suspicions about Stark and as Reed got closer to the truth about Stark, Chen Lu ordered Stark to kill Reed. Iron Man soon attacked Reed Richards but purposely dropped a cassette tape during the attack. Keeping Iron Man busy with holograms, Reed played the tape back at double speed, revealing it to be a tape revealing Chen Lu's blackmail of Stark. Getting his point across to Iron Man, Reed arranged for Tony to feign defeat. While "captured" by Reed, Stark's implants were removed and his heart repaired. As Tony recovered in a hospital next to Nick Fury, he arranged for the Iron Man armor to be filled with guidance systems and explosives. The armor was then sent to Chen Lu's headquarters where it exploded. Tony Stark's Iron Man armor had numerous gadgets and enhancements that his Earth-616 Mark I armor had, including superhuman strength, durability, flight via air pressure jets, repulsor rays, and devices to keep his heart beating. It also had gadgets not seen on the Earth-616 armor, including a pyro-chemical projector in the wrists that fired a quick-congealing chemical that would instantly form into an ice-like crystalline mass that could trap opponents. It was also equipped with an image duplicator that could project holographic images, a pheromone mist projector, self-heating marbles that could burn with enough heat to melt through a metal building roof, metallic claws that extend from the armor's wrists, a releasable and explosive drill sleeve stronger than diamond, wind-impeller discs, and explosive metallic balls that could scatter the particles of an electric charge. Before the surgery by Reed Richards, Tony Stark had metallic implants installed in his skull that could allow him to communicate mentally with Chen Lu via radio waves. Chen Lu could also communicate back and monitor Stark's life through the implants. Chen Lu was just like his Earth-616 counterpart up until he was sent the captive Tony Stark. Intrigued by the potential use for Stark as an unwilling spy for his communist agenda, Chen Lu opted to manipulate Stark instead of continuing his experiments that might have turned him into the Radioactive Man. Installing metallic implants into Stark's skull, Lu had Stark sent back to America where he monitored and manipulated Stark for months. Upon learning from Stark's implants that Nick Fury was to become the director of the newly-created S. H. I. E. L. D. agency, Chen Lu affiliated himself with Hydra in order to have Nick Fury killed before he could assume the position. He then ordered Stark to kill Reed Richards, as the leader of the Fantastic Four had come dangerously close to discovering Stark's connection with Lu. Unfortunately for Chen Lu, Stark feigned defeat in order to have Reed remove the implants and while Stark recovered from his ordeal, his Iron Man was on its way to Lu's headquarters, filled with guidance systems and explosives. The Iron Man soon crashed into the headquarters and exploded, apparently killing Chen Lu and his servants. The Melter was the same as his Earth-616 counterpart, being an early Iron Man villain. He presumably had the same melting technology that his 616 counterpart possessed. Mister Hyde was no different than his Earth-616 counterpart, being an early villain for Thor. Hyde presumably had superhuman strength and durability, like his 616 counterpart. "Pepper" Potts worked for Tony Stark and was exactly like her Earth-616 counterpart. Thor was the same as his Earth-616 counterpart, aside from not being a member of the Avengers which never formed without the early presence of Iron Man. When the armored Iron Man eventually did hit the scene, Thor welcomed him as a hero, despite being a bit unsure of his prowess in battle. 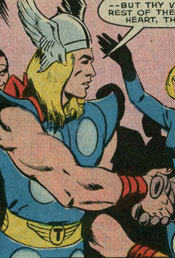 Thor presumably had the same godlike physical attributes that his 616 counterpart had. He also had the enchanted hammer Mjolnir that would allow him to fly and control the weather. Wasp was the same as her Earth-616 counterpart except for being a member of the Avengers, as the Avengers were never formed in this reality without the early presence of Iron Man. When Tony Stark did finally unveil the Iron Man armor, the Wasp attended the press conference along with Ant-Man. She presumably had the same shrinking and bio-electric generation abilities that her 616 counterpart had. She also had insect-like wings capable of flight. Professor Yinsen was a physicist who was captured by Wong Chu. When Tony Stark was also captured, Yinsen was placed with him so that they could come up with a weapon to aid Chu. Instead, the two constructed a suit of armor that would keep Stark alive and help them escape. In an effort to buy Stark some time to charge the armor, Yinsen ran outside and created a distraction. He was quickly killed before Stark could fully charge the armor and Stark was left helpless before Wong Chu.